So you’re thinking of assembling an emergency kit. Great! As you are putting your kit together, you may find that you actually need more than one, each serving a slightly different purpose. I’ve outlined five kits you may need to have for your family. Add any others you think of in the comments! I don’t like to be limited to a three day time period, but 72 hour kit is the most common name for these general, short term supply kits. When you put yours together, I suggest adding another bag or tote of additional food nearby that can be grabbed if needed. If you make your 72 hour kit portable, you have a Bug Out Bag. An excellent reference for building a bug out bag with product ideas, creative additions, and checklists is Build the Perfect Bug Out Bag by Creek Stewart. Remember to pack differently for infants, children, and pets. What if you’re driving when the emergency happens? A car emergency kit will help you survive in your vehicle or get back to your family. I spend a lot of time in my car and am a big believer in having a well-stocked emergency kit with me. We regularly use ours for needs like feminine hygiene, diapers, medication, water, and blankets. Not sure what to put in your car emergency kit? Here’s a great printable list for you! A Get Home Bag is designed to get you from where you are when you encounter your emergency, back home to your family. This could be part of your vehicle kit, or you may need make one to keep at your work as well. Consider what you may encounter if you have to walk from your work to your home and plan your Get Home Bag accordingly. Here is an excellent article from a family that put together a Get Home Bag for their father. These kits are small, sometimes packed in little metal Altoids style tins or pill bottles. Only the essentials are going to fit, so you may need to get creative. These pockets kits travel easily with you when you in a pocket or purse and can be a real life saver. 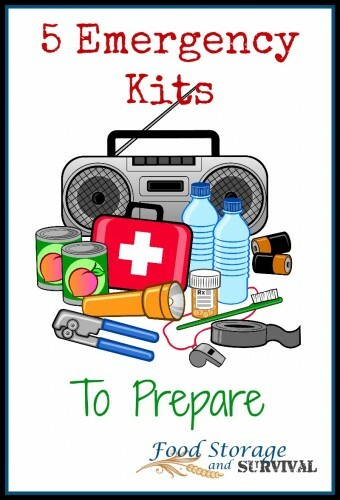 ‘Tis Eventide has a roundup of six great mini emergency kits here. Yes, first aid should be included in each of your other kits. But you’ll probably want to have more medical supplies than will fit easily in the other kits, so just give in and put together a nice first aid kit. These can be purchased pre-assembled or you can build your own. For an example of how a first aid kit is done right, here’s a fully stocked medical kit put together by a nurse friend of mine. Having your emergency supplies assembled into a kit makes them easy to find and use when the emergency strikes. Get busy and get a kit put together for your family!